I finally got kubuntu edgy installed in Virtual PC. First of, the normal install CD won't work since X doesn't display properly. The alternate CD has a text based installer, which works though. I first went to ubuntu, but their new download page doesn't seem to have an option to download the alternate CD (If it does, please comment :). The kubuntu page was quite simple though, with the alternate CD right their. Since I prefer kUbuntu, I didn't spend more time looking around. The first time I tried the install, the text installer wasn't displayed properly as well. I had to reset, and specify 640x480, on the grub menu. I think the option is F5. Once done, I set networking to NAT, the default was my broadcom NIC, which wasn't connnected, hence no network. And from their the install went along as normal. After the install, the X display is still corrupt. Just as X started I pressed Ctrl-Alt-F1. If you take too long, it will corrupt the display, can Ctrl-Alt-F1 will remain corrupt as well. Their is a better way by passing the proper options in grub to boot to text mode, but this was easier, and I forgot what those options are. Once on the console, I edited /etc/X11/xorg.conf, and set the Default Depth to 16. 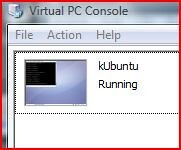 Restarted kdm, /etc/init.d/kdm restart, and I have kUbuntu running on Virtual PC.